The House of Zähringen (German: Zähringer) was a dynasty of Swabian nobility. Their name is derived from Zähringen castle near Freiburg im Breisgau. The Zähringer in the 12th century used the title of Duke of Zähringen, in compensation for having conceded the title of Duke of Swabia to the Staufer in 1098. The "Duchy of Zähringen" (Herzogtum Zähringen) by definition consisted of the territories and fiefs held by the Zähringer, and it was not seen as a duchy in equal standing with the old stem duchies. The Zähringer attempted to expand their territories in Swabia and Burgundy into a fully recognized duchy, but their expansion was halted in the 1130s due to their feud with the Welfs. They were granted the special title of Rector of Burgundy in 1127, and they continued to use both titles until their extinction in 1218. Pursuing their territorial ambitions, they founded numerous cities and monasteries, on either side of the Black Forest as well as in the western Swiss plateau. After their extinction, parts of their territories reverted to the crown (attained imperial immediacy), other parts were divided between the houses of Kyburg, Urach and Fürstenberg. The title of "Duke of Zähringen" was revived in the 19th century by the House of Baden, which shares descent from Berthold II, Duke of Carinthia with the House of Zähringen. The earliest known ancestor of the family was one Berthold, Count in the Breisgau (d. 982), who was first mentioned in 962. In view of his name, he may have been related to the Alemannic Ahalolfing dynasty. Berthold's great-grandson, the later Berthold II, Duke of Carinthia (posthumously known as Berthold I of Zähringen, c. 1000–1078), held several lordships (Herrschaften) in the Breisgau, in Thurgau, Ortenau, and Baar. By his mother, he was related to the rising Hohenstaufen family. Emperor Henry III had promised his liensman Berthold the Duchy of Swabia, but this was not fulfilled, as upon Henry's death, his widow Agnes of Poitou appointed Count Rudolf of Rheinfelden to the position of Duke of Swabia in 1057. In compensation, Berthold was made Duke of Carinthia and Margrave of Verona in 1061. However, this dignity was only a titular one, and Berthold subsequently lost it when, in the course of the Investiture Controversy, he joined the rising of his former rival Rudolf of Rheinfelden against German king Henry IV in 1073. Berthold's son Berthold II (c. 1050–1111), who like his father fought against Henry IV, inherited a lot of the lands of Rudolf's son Count Berthold of Rheinfelden in 1090 (though not his comital title, which stayed with the family von Wetter-Rheinfelden). Berthold II is so named both as Duke of Swabia (following Berthold of Rheinfelden, the first duke of Swabia of this name) and as head of the House of Zähringen (following his father, who is counted as Berthold I of Zähringer in spite of not historically having used the name Zähringen). 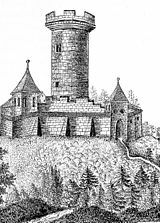 Berthold II did use the "Zähringen" name, although he moved his main residence from Zähringen Castle to the newly-built Freiburg Castle in 1091. In 1092, Berthold II was elected Duke of Swabia against Frederick I of Hohenstaufen. In 1098, he reconciled with Frederick, renounced all claims to Swabia and instead concentrated on his possessions in the Breisgau region, assuming the title of Duke of Zähringen. He was succeeded in turn by his sons, Berthold III (d. 1122) and Conrad (d. 1152). 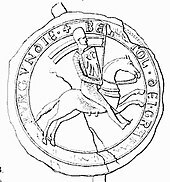 In 1127, upon the assassination of his nephew Count William III, Conrad claimed the inheritance of the County of Burgundy against Count Renaud III of Mâcon. Renaud prevailed, though he had to cede large parts of the eastern Transjuranian lands to Conrad, who thereupon was appointed by Emperor Lothair III as a "rector" of the Imperial Kingdom of Arles or Burgundy. This office was confirmed in 1152 and held by the Zähringen dukes until 1218, hence they are sometimes called "Dukes of Burgundy", although the existing Duchy of Burgundy was not an Imperial but a French fief. Duke Berthold IV (d. 1186), who followed his father Conrad and founded the Swiss city of Fryburg (today's Fribourg-Freiburg) in 1157, spent much of his time in Italy in the train of Emperor Frederick I Barbarossa. His son and successor, Berthold V, showed his prowess by reducing the Burgundian nobles to order. This latter duke was the founder of the city of Bern (1191), and when he died in February 1218, the ducal line of the Zähringen family became extinct. Among other titles, the Zähringen family acted as Reichsvogt of the Zürichgau area. After the extinction of the ducal line in 1218, much of their extensive territory in the Breisgau and modern-day Switzerland returned to the crown, except for their allodial titles, which were divided between the counts of Urach (who subsequent called themselves the Counts of Freiburg) and the counts of Kyburg, both descended from the sisters of Berthold V. Less than fifty years later, the Kyburgs died out and large portions of their domains were inherited by the House of Habsburg. Bern achieved the status of a free imperial city, whereas other cities such as Fribourg-Freiburg only obtained the same status later in history. Berthold I (ancestor of both the House of Zähringen and the House of Baden) held the comital titles of Breisgau, Thurgau, as well as being reeve in Stein am Rhein (owned by the bishop of Bamberg). The county of Thurgau was lost in c. 1077. Berthold II, founder of the House of Zähringen proper, in 1098 received Zähringen castle and the jurisdiction over Zürich (alongside the Counts of Lenzburg until 1173). Ownership of the county of Rheinfelden and of Burgdorf also dates to c. 1198. The "rectorate" of the county of Burgundy was granted in 1127 (inheritance of Otto-William, Count of Burgundy). Ownership of Burgundy was contested, and Zähringer de facto rule was limited to the parts of Upper Burgundy east of the Jura and north of Lake Geneva. The territories south of Lake Geneva were conceded to the Savoy and Provence in 1156. In compensation, Berthold IV received the investiture right for the bishops of Geneva, Sion and Lausanne, de facto realised only in the case of Lausanne. The extinction of the counts of Lenzburg in 1173 strengthened the Zähringer position south of the Rhine, but their territorial expansion was halted following their support of the Welfs in the unsuccessful feud against Conrad III of Germany during 1138–1152, and frustrated their ambitions to carve out a contiguous territorial duchy wedged between Swabia and Burgundy, in spite of late attempts on the part of Berthold V to increase his territorial sway (who as late as 1210 aimed at receiving the jurisdiction over St. Gallen). Instead of territorial expansion, the dukes of Zähringen from the 1150s focussed on attaining more immediate feudal control over the territories they already had. This included their policy of expanding settlements into fortified towns or cities and the construction of new castles, mostly in their territories north of the rhine, while their encroachment on the rights of the comital nobility south of the Rhine seems to have been resisted, mostly passively but in the case of the lords of Glâne and Thun in an open revolt in 1191. The fragmentation of the Zähringer possessions after 1218 was an important factor in the communal movements of the late medieval period in the region, including the imperial immediacy of Bern and Zürich, and the growth of the Old Swiss Confederacy in the early 14th century. Aare basin: Fribourg (Freiburg im Üechtland, 1157) Bern (1191), Burgdorf (castle before 1175), Murten (c. 1180), Thun (c. 1190). Other towns owned by or under the jurisdiction (Reichsvogtei) of the Zähringer include: Solothurn (acquired 1127), Zürich (acquired 1173), Schaffhausen (acquired 1198), Stein am Rhein[year needed]. The city of Morges on Lake Geneva is not a Zähringer foundation (having been founded in 1286 by Louis I of Vaud) but shared the characteristic layout of the Zähringer cities. 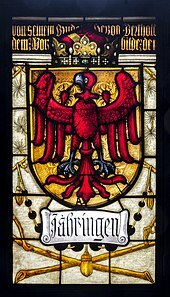 Zähringen attributed arms in a stained glass window by Hans Reichle (c. 1570–1642) in Freiburg town hall. There are two traditions of attributed arms, either or an eagle displayed gules (shown here) or gules a lion rampant or, based on the respective coats of arms used in the later medieval period by the counts of Freiburg who claimed the Zähringer inheritance (the houses of Fürstenberg and Schönborn). Berthold II (c. 1050–1111), Duke of Swabia from 1092 to 1098 (against Frederick I of Hohenstaufen), then Duke of Zähringen from about 1100. The numeral II carried by Berthold refers to both the House of Zähringen (succeeding his father Berthold I) and the Duchy of Swabia (succeeding Berthold I, Duke of Swabia of the House of Rheinfelden). The Veronese margravial title was used by Herman I of Baden, the eldest son of Berthold I of Zähringen. Herman's son, Herman II, was the first to use the title of Margrave of Baden in 1112. Now more commonly known as the House of Baden, Herman's descendants ruled successively as margraves until the Final Recess of 1803, as Electors of the Electorate of Baden until 1806, then as Grand Dukes of Baden until the end of the German monarchy in 1918. The current holder of the title of "Margrave of Baden, Duke of Zähringen" is Maximilian, Margrave of Baden (b. 1933), a grandson of the last chancellor of the German Empire (Prince Max von Baden), who seems to have revived the Zähringen title after it apparently had not been in official usage since the death of Berthold V(1160-1218). Another branch was that of the Dukes of Teck, descendants of Duke Conrad's son Adalbert, whose line became extinct in 1439. Adalbert I (d. 1195) was a son of Duke Conrad I of Zähringen, and upon the death of his brother Berthold IV in 1186, he inherited the family estates around Teck Castle and, from 1187, adopted the title of Duke of Teck. His descendant Conrad II of Teck (1235–1292) allegedly was designated King of the Romans shortly before his assassination. The line became extinct in 1439 with the death of Louis of Teck, Patriarch of Aquileia. This ducal title was later granted to Count Francis of Hohenstein (1837–1900), a morganatic son of Duke Alexander of Württemberg, in 1871. Francis' daughter Mary of Teck (1867–1953), as the wife of King George V, was Queen of the United Kingdom and the British Dominions, and Empress of India. ^ Erwin Eugster: House of Zähringen in German, French and Italian in the online Historical Dictionary of Switzerland, 2015. ^ August Freiherr von Berstett, Münzgeschichte des Zähringen-Badischen Fürstenhauses (1846), p. 3. ^ The shield with heraldic eagle visible in this seal (from a document at Fraumünster, Zürich, dated 1187) is the only contemporary attestation of a Zähringer coat of arms. Franz Zell, Geschichte und Beschreibung des Badischen Wappens von seiner Entstehung bis auf seine heutige Form (1858), p. 7 and plate I. ^ "Baden". Paul Theroff’s Royal Genealogy Site. Chisholm, Hugh, ed. (1911). "Zähringen (family)" . Encyclopædia Britannica (11th ed.). Cambridge University Press. Rines, George Edwin, ed. (1920). "Zähringen" . Encyclopedia Americana.